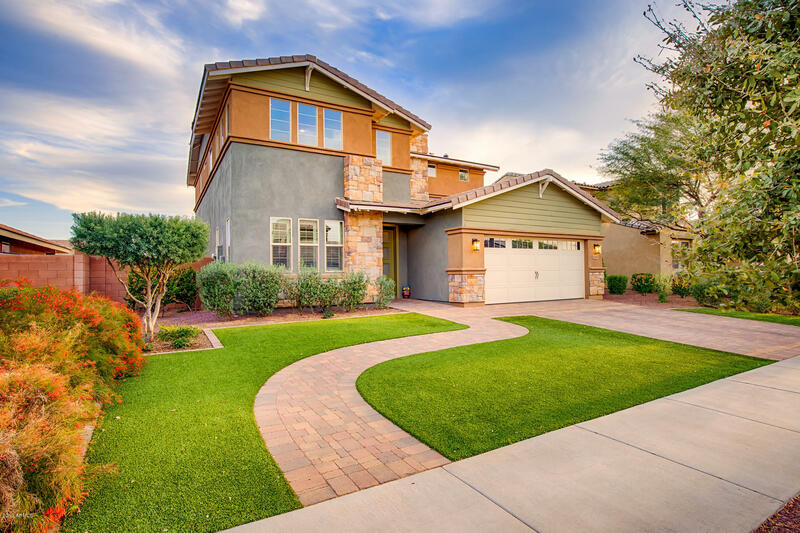 All GREER RANCH NORTH PHASE 2 homes currently listed for sale in Surprise as of 04/23/2019 are shown below. You can change the search criteria at any time by pressing the 'Change Search' button below. "Welcome home to this amazing model home with a gorgeous chef's kitchen. As you enter into the property you will find a large open floor plan and eat in kitchen. Entertain all your guests at the oversized kitchen island. This property features 4 bedrooms, 3 bathrooms along with an additional flex space. The kitchen features stainless appliances including a gas cooktop and wall ovens, maple cabinets, granite counter tops, and an oversized island. The master suite has a spacious bath with dual sink"
"Gorgeous home with 3 bedrooms, 2 baths, and a pool to cool off in this summer! The open great room floorplan features office/den space & formal dining. Kitchen includes stainless steel appliances, wall oven, staggered cabinets, granite counter tops, and a large island w/breakfast bar. Master suite has spacious bath with dual sinks, walk-in shower & walk-in closet. 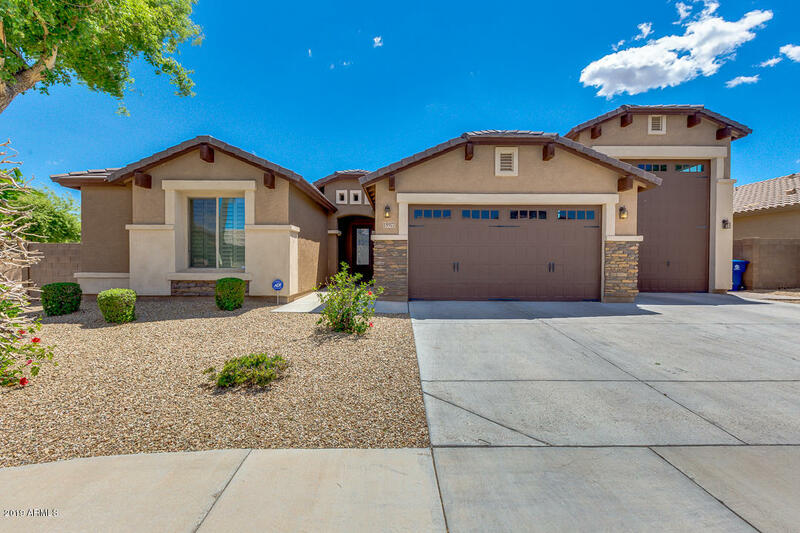 Extensive upgrades throughout include: pavers at driveway, walkway, and backyard; two tone paint, upgraded doors, hardware, light fix"
"HIGHLY UPGRADED HOME!!! LOADED with high end finishes including guest suite with kitchenette. Stunning GOURMET kitchen features gas cooktop, wall ovens, maple cabinets, huge island with granite countertops, pull-out shelves, backsplash lighting and upper cabinet lighting. This great room floorplan is perfect for entertaining with electric fireplace feature that spans the wall of the family room, multi-slider glass patio door, brick faced wall, & farmhouse accent wall at the dining area. Gorgeou"
"Amazing corner lot home in the highly desirable Greer Ranch North subdivision! Featuring super RV garage with built-in cabinets and back door. Awesome great room floor plan with den, plantation shutters, 3 bed, 2 bath, and custom paint finishes. Open concept kitchen equipped with granite counters, crown molding in cabinets, island with breakfast bar, pantry, and SS appliances. 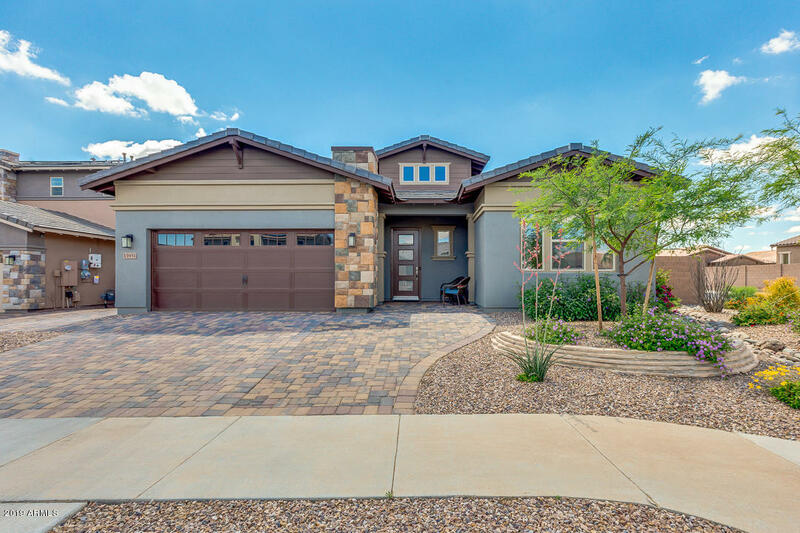 Beautiful master suite includes private exit, walk-in closet, and en-suite bath with double sinks, step-in shower, and s"
"Welcome home to Greer Ranch!The Damon plan opens up with two charming bedrooms sharing access to a full bath. Beyond the entryway, a formal dining room can be optioned as a private study. Toward the back of the home, a generous great room flows into an inviting kitchen with a center island, walk-in pantry and breakfast nook. This open-concept area also boasts an adjacent covered patio, as well as access to a lavish master suite--boasting a roomy walk-in closet and a private bath with deluxe opti"
"Best home on tour! Extraordinary Location! 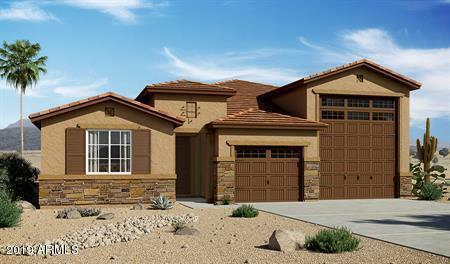 This immaculate, professionally-designed 2-story home invites comfort, and exudes elegance. 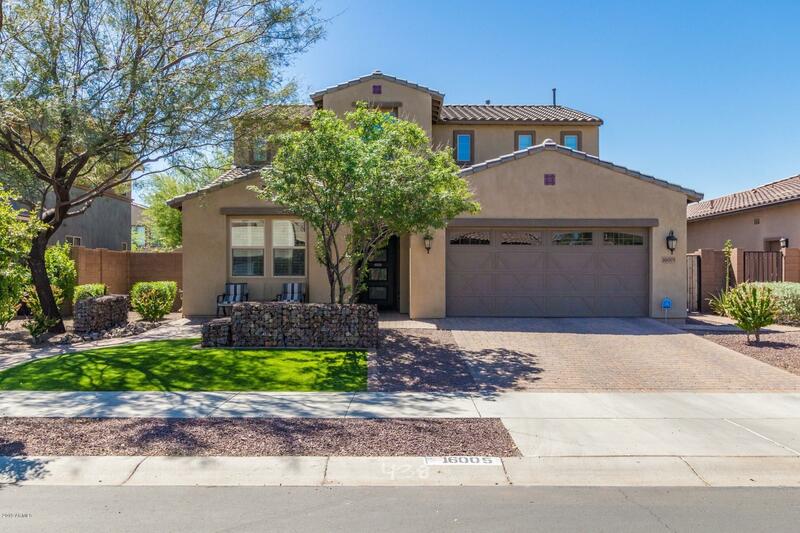 With 4 bedrooms, 3 and a half baths, generous living space and stylish finishes. Upon entering this home you are greeted with the sprawling cathedral ceilings, light and airy space and soothing paint palettes. 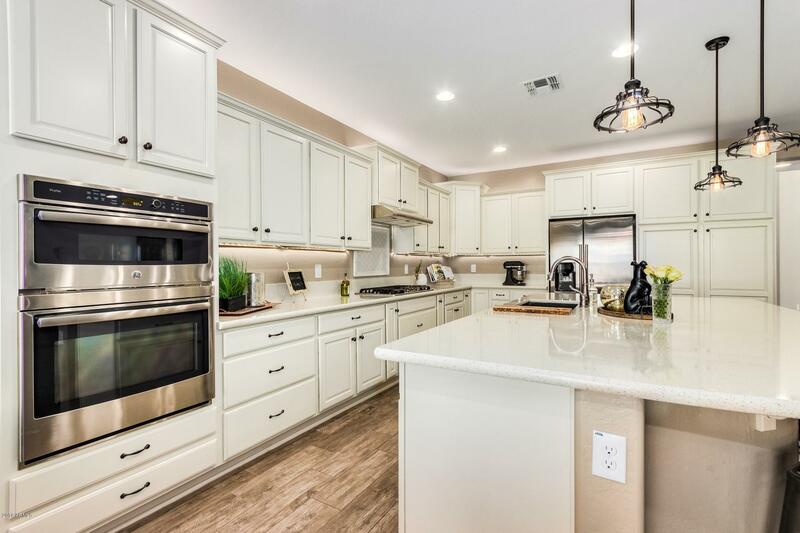 The chef inspired island kitchen features a myriad of cabinetry and storage, SS appliances, drawer pull outs, sleek finishes/fixtures, pantry, gorgeous qua"
"Stunning 4 bedroom, 3 bath home in Greer Ranch North! Home features a split floorplan and open concept with tile throughout, wood plank wall accents, neutral color pallet, and ceilings fans t/o. 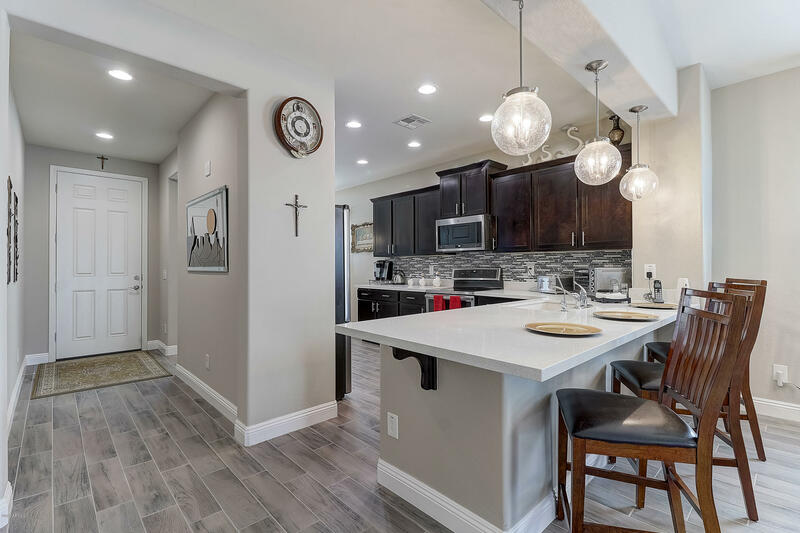 Gourmet kitchen boasts quartz countertops, white cabinets, tile backsplash, stainless steel appliances, gas cooktop with stainless steel exhaust hood, island w/breakfast bar, and tons of cabinet space! 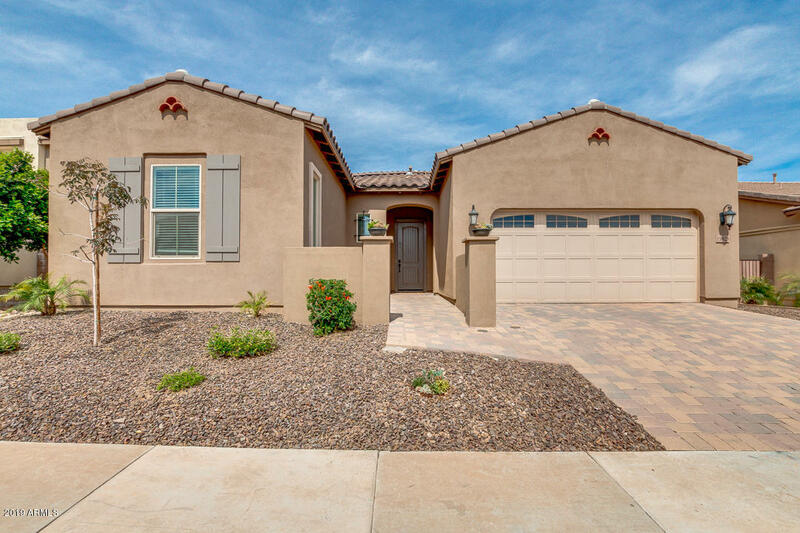 Master bedroom with ensuite featuring a tiled walk in shower with multiple shower heads, dual sinks, "
"Beautiful single level hardly lived in in desirable location in Surprise. Bright kitchen with breakfast room, beautifully upgraded 42''cabinets, stainless steel appliances, quartzcounter tops and unique pendant lighting, breakfast bar, overlooking dining room and family room with walk out to a covered patio.Master bedroom with nice size walk-in closet, double sinks and oversized shower. Split floor plan with other two bedrooms and a bathroom plus nice size den. Front load washer and dryer stays."